Have you discovered a will for your ancestor but are puzzled by the legal terminology? You might have extracted some information like names of sons or daughters but aren’t sure what to do with the rest. 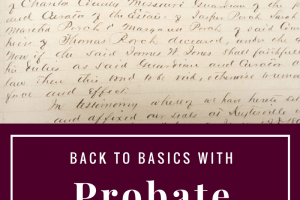 Back to the Basics with Probate Records – Part 1 discussed what information might be in a probate record and how to locate the records for your ancestors. Now it’s time to learn about the document that is often first in a probate file – the will. What are the various types of wills and how can you use them in your research? A will is often drawn up when an individual is in ill health or aged and preparing for death. Wills vary in length and breadth. They may be long and involved, stating many heirs and much property; or they may be short and simple. Holographic – Usually written and dated entirely in the handwriting of the testator, and signed by him. This type of will generally doesn’t require witnesses, but the statues differ from one state to another. 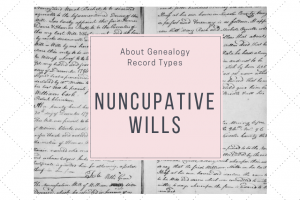 Nuncupative – An oral will, witnessed by two or more persons. It is usually only valid if given in a moment of danger or imminent death, often limited to soldiers on the battlefield or sailors at sea. To be valid it must be written within a certain time period, generally six to twelve days. Formally witnessed – In order to be valid, the will has to meet the formal requirements of the state statute. In effect, that law defined the requirements for a valid will, and holographic and nuncupative wills are specific exceptions to the general requirements for validity. Most of the wills that you will use are formally witnessed and generally include the following components. I’ll use the example of the will of Thomas Beverly Royston to illustrate. Preamble. The testator (the person whose will it is) identifies himself or herself (a woman is known as a testatrix) by name, usually giving a place of residence, and for testatrixes, often stating “wife of,” “widow of,” or “daughter of,” depending on her marital status. The preamble will also have language concerning the mental status of the testator—for example, “being of sound mind and judgment”—designed to show legal capacity to write a valid will. Payment of debts. Most wills generally direct that all just debts be paid before any distributions are made, as required by law. Specific gifts: bequests and devises. These are gifts of specific property or amounts of cash given to specific individuals. This part of a will often provide us with names of specific relatives and friends. Residuary distribution. This clause specifies to whom the residue (what is left of the estate after paying costs of probate court administration, debts, and specific gifts) is distributed. In most cases, this residue will be given to the spouse (if still living), then to the children, although the final beneficiaries might be other relatives or friends. Often sons–in–law are listed in place of their wives, which can be a significant clue when looking for the family of a woman. Often the residue (called a life estate) will be given to the spouse only during her lifetime, and then given to one or more children. In that case, look for probate court action or transfers of real property when the surviving spouse dies. Naming executor(s). The executor (executrix if female) is the person appointed and authorized by the court to handle the affairs of the decedent. The person named is usually a son, brother, or trusted friend. A wife or her brother might be named to serve if she or her family has assets and interests to protect. Often in this clause, the legal requirement of the executor posting a bond during court administration is waived. Guardian for minors. Most states do not allow distribution of property to minor children. Since a guardian has to be appointed, the testator would name the person he wanted to serve in that capacity. Often the language does not specifically say “guardian” but provides that all decisions are to be made by an older child or brother for a specific child who is a minor. Revocation of previous wills and codicils. It is standard language to revoke all prior wills and codicils. This does not necessarily mean there are any, but the procedure is precautionary in nature. Often this concept is incorporated into the preamble. Execution Clause. This contains the signature of the testator and those of the witnesses, usually with language to state the circumstances surrounding the signing of the will to establish its validity. Not all family members have to be listed in a will. In the case of Thomas B. Royston, he only mentions three children and one grandson. He actually had fourteen children and several more grandchildren by 1867. Why are they not listed? A clue would be the statement “after my children which are now unmarried & minors be made equal with my children which are married.” Perhaps he already gave land or an inheritance to his married children and his minor children are not old enough to receive theirs. Obviously there are more children in this family, making it necessary to look at other records. When analyzing a will, read it carefully to determine any clues to additional family members. You may discover a will that lists many heirs with no relationships. Then it is up to you as the researcher to use other records to put together the family. An individual may leave property not only to children and grandchildren but nieces, nephews, friends,etc. Just as in a census, be careful about assuming that the wife named in the will is the mother of the children named in the will. She could be a second or even third wife. Interested in learning the rest of the story about the will of Thomas B. Royston? Check out my post, Probate 101 or The Real Life Drama of the Thomas B. Royston Estate. What happens once an individual dies and the probate process begins? What other records might be generated to help in your search for your ancestors? Back To the Basics with Probate Records – Part 3 will conclude this series, so stay tuned. What wills have you discovered in your research? Maybe it’s time to take a second look and see what new clues to your family might be waiting for you. 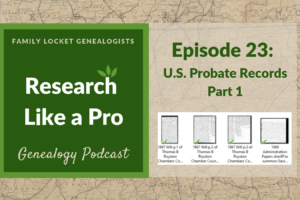 If you want to read more about how to do genealogy research, I encourage you to check out our book, Research Like a Pro: A Genealogist’s Guide, at Amazon.com. Best of luck in all of your family history endeavors! This is an affiliate link. If you click the link and make a purchase, we receive a small commission but it doesn’t change the price of the item. Thank you!